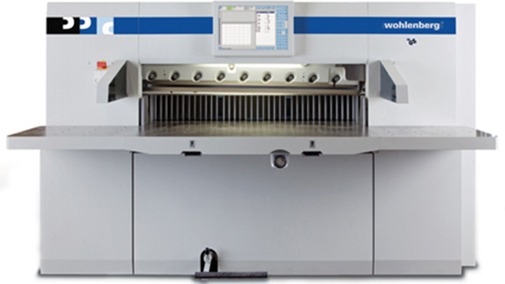 The Wohlenberg range of high speed guillotines offer a wide range of sizes from 76cm to 225cm. The controls and interface are designed to make the cutting process as simple and safe as possible. The cutting machine range represents the highest standards of build, quality, safety and cutting accuracy. For comfort and ease of turning heavy reams the machine table is closed, forming a strong air cushion. The elimination of the slot gap means no air cushion erosion and no trapped or folded sheets on the bottom of the paper stack. The side gauges of the new Wohlenberg are from extra thick-walled aluminum. Only when registering the cutting stock against totally perpendicular side gauges can you expect a precise square cut.